Apparently the NAACP is gathered today to vote on a resolution labeling assembly protest as a deterrent to progress. The NAACP, who has long lost legitimacy through its racist rhetoric, has decided to step up a manufactured race divide aimed at Americans gathered at Tea Party rallies and condemn them as 'racists' and a threat to democracy. Where is any evidence of Tea Party "elements" being dangerous or racists? Months and Months have passed since Andrew Breitbart has offered a 100,000 reward for anyone with proof that anyone was deliberately spat on or the N-word was yelled at a congressman at a tea party rally. No one has come forward with proof. Not even from the police officer who was standing right next to the escorted accuser. This isolated unproven single incident allows for a completely segregated organization to label the Tea party people as racists? The Tea Party not only has participants of all political ideology represented and present, but the crowds & speakers at rallies are of all diverse ethnic peoples. They are not there because they are black or white or red or green. They are there as fed up Americans who have a pretty clear 'message' to - Roll Back Big Government - Reform Spending Spree - Constitutional Governance - Stay out of Health & other personal liberty Choices - Deregulate the foot on the throat of business - & Taxed Enough Already. How is any of that message racist? It is the NAACP who refer to any black Tea Party people as "Uncle Tom's. "..Or was that incident isolated? How about the SEIU thugs beating up a black Tea party participant? A collective salvation lesson for the individual? ...the Department of Justice preferential race policies...signaling uncivil hate groups a wink and a nod amnesty. America as we know it is in trouble- stay home and ignore it or get out and protest. It increasingly becomes harder to write about these backward-advancing race card dealers without taking sides in the debate and becoming a part of this engineered division. Trying to write anything to penetrate and reconnect that liberal logic disconnect with actual examples falls on brainwashed synapses. If you try to point out why they are incorrect- you are a racist. So don't try to point it out. Run awaaaaaay. 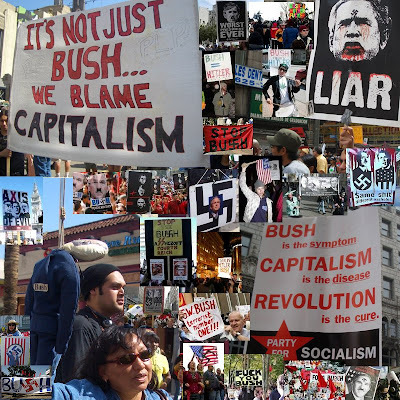 If Obama writes that he prefers the company of radicals and his Marxist professors and he begins filling Government positions with Marxists, Maoists, Communists, anti-capitalists, one world governance radicals, racists, eugenicists, and people who do not believe in our constitution and you dare to carry a sign proclaiming Obama as a socialist/Marxist/ - then yer a whacko racist. If you point out that illegal trespassing occupiers are costing billions and economically bankrupting states and that you support States Sovereign right to enforce LAWS and protect itself - then you are a racist - so don't say a word in protest. Doesn't matter if the crowds are diverse...If you carry a poster protesting out of control big government you are a pro-constitution anti-government extremist added to the FBI description of a white domestic terrorist. If a man exposes Obama's Green Jobs Czar as a communist racist then the advertising punishing boycotts start because dang if he... isn't a racist. If you are against the government being in control of cradle to death socialized medical rationing ( whose track record has bankrupted Social Security, Medicaid, Medicare, the Post Office, our Mortgage equity, and everything else they interfere with) then YEP - you're a racist. Why would anyone have a sign comparing what is happening in our country - as Obama uses Stimulus dollars to fund criminal organizations, establishes communication censorship, builds an Americorps security force, requires mandatory servitude, and takes over Banks, Car companies, Media, Newspapers, Internet, Education, Health care, Wall Street, integrating State n Religion with promises of 'social justice' tything, while pushing a "necessary skyrocketing" Energy Tax scam, overseen by installed anti-American, one world order, regulating czars - with socialist/Leninist/fascist images?? Goodness! It just doesn't make sense to protest any of this unless - you're a racist. 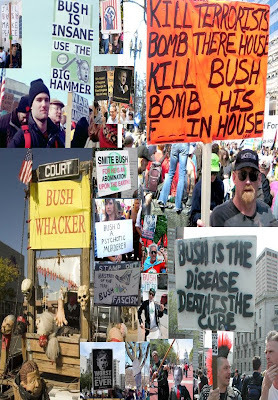 I really hate to use the tired argument of 'where were you during the BUSH'- this or that - years used by the left hypocritical guardians of hate speech ... but where were any of these people's complaints when people gathered with lynching-death-Nazi-Bush-signs? Oh- that's right - the professional victims complaining are the ones carrying the signs. Totally untrue. When? Where? Show it. This is a leftist tactic being used to censor dissent. The reality is that Tea Party participants are not racists. They are terribly concerned that this country is being transformed into something that America is not through this Obama UNconstitutional Administration of Marxist take over. Protests have nothing whatsoever to do with the color of a mans skin. These same people put the man in Office. It is all about what is in Obama's post-exposed character and policies. Mr. Uniter - Pelosi- the NAACP - the Progressive Caucus - Democrat enablers - are now inciting a pre-election demographic, inflaming, regressive, division that is absolutely despicable. This Admins continued War with Americans to bring about Obama's formula of changes, while using untrue race accusations, could set us back by decades but still they push the illusion because for progressives the 'ends justify the means'. And, as Alinsky power rules taught Obama - keep the people bitter and rub the sores raw.